Home » Insurance and Risk Management » Is Baby Insurance a Good Buy? Before I even begin to show you the math, I personally believe that life insurance is necessary only if someone is dependent on your income; therefore, life insurance for your baby is just a waste of money. According to my calculation, paying $15.90 a month for 20 years add up to $3,816 ($15.90 x 12 x 20). Gerber also went on to say that after 20 years, my son could turn in the policy and get all the premiums I paid back (this is the approximate cash value after 20 years). Not so fast. I made another calculation which assumes 10% return on invested capital. If I invest $191 ($15.90 x 12) a year, and get an average return of 10% per year for the next 20 years, I could have $12,000 by then. So which one sounds better to you? Buy the insurance and get $3,816 cash value after 20 years (with $25,000 death protection), OR invest $191 a year to get $12,000. Personally, I think $12,000 sounds better. I agree that people get into this without really looking at all of the details. Gerber is making way to much money off of the peace of mind concept. I put about 1,000 into my gerber plan over 4 years with my daughter. It was a nice peace of mind for me being a first time mom… but with more kids…. not affordable. And am alot happier putting that money now into savings. But then again I also have Life insurance on her now with the military that will go on through our lives. I think if you are going to do this do the bear minimum on kids then put the same amount aside into a savings account for them. On my plan if I would have kept it going until she was 18, it would have been a cash value of 2300 at 18 years and they would have kept 2,000+ of it along with all the interest they make. It would be nice if they re thought their plans over. Bear minimum only otherwise it is a waste. College plans also! save that money and keep you interest. Life happens, job losses may happen, you may loose your insurance for a period of time so unless you are set, this plan is okay. I know people who have lost loved ones that have had to come up with funeral expenses. It is sad enough to loose someone but then to struggle financially for months to years with that hardship…. So many people buy life insurance for investment purposes but what about the fact that the child will have whole life policy from a young age. I know as a young adult, purchasing life insurance was not a priority and for many people applying later in life can lead to policies becoming unattainable due to health reasons or premiums are through the roof. I purchsed life insurance for my daughter for the reason that we do not know what our health will be in the future and god for bid she develops a sickness she will be covered for her and her future family. What happen to my brother is very poor. After a week my dad stop pays the insurance, he got accidents. Life insurance for a baby IS a waste of money. I would never recommend this to anyone. Companies use scare tactics in order to coerce parents into something that will almost definitely be useless to them and actually leads to losing money. Ah, Pinyo. I hear you, I do.But ALL businesses are in the business of making money. In the best of circumstances a business can find a way to make money and serve people at the same time. I’m not trying to say insurance companies are altruistic, I’m trying to say they’re little different than any other business. You can call it “scare tactics”, or you can call it “more things to think about before making a decision”. I tend to filter everything I hear from salespeople through that filter, and rebut the things that don’t fit for me as I weigh all of the relevant factors in my decision. Sure, insurance companies make money on you if you cancel the policy. But if you carefully consider your purchase before making it and never cancel it you will alwayscome out ahead. After all, everyone dies. I wrote a post myself about why life insurance isn’t always a bad idea for kids, and I’m still glad I got my policy for my son. This is a really good debate, and I appreciate the forum to give my 2 cents. Or 2 dollars. @Melissa – But the examples you used are the kind of scare tactics that insurance sales agent use. I can relate to not wanting to work if something happen to your child and it may make financial sense if you ended up with a good policy. But for most cases, the insurance company wins 99.9% of the time. Let’s be honest, insurance companies are not in the business of helping parents recover from emotional trauma. They are in the business of making money — and some even willing to exploit our emotional vulnerability to make a profit. I know it might sound harsh for new parents to think about anything ever happening to their baby, but reality is that is does happen. My x-husband is a life insurance agent and several times I have gone into homes to work with his clients. I have seen so many diffrent situations. A family I visited a couple of months ago had requested information on some of our policies ….. I called them and they didn’t have time that week for me to come out… the following week I set an appointment but they cancelled …. this happened about 4 times and then finally after a month and a half I went out to see them. During the time from the first call and my visit their 5 month old baby passed away during the night. They never thought it would happen to them … nobody does. Wouldn’t you rather be more safe then sorry??? I had another family who lost 3 of their 5 children within 4 short months…. I do not depend on income from my children but you better believe that I would not be returning to work right away if something ever happened to to them. What would you do if one of your children passed??? scary idea but it happens everyday. Would you be able to return to work??? how about pay the house payment??? how are you going to pay any medical related costs??? Or what about care for any other children??? Money does not cure your pain but it does allow for you to cope a little bit better with the other situations going on around you….. 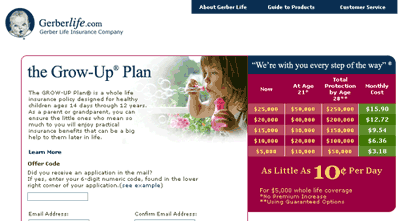 When we were expecting our daughter I was shocked to see that our baby purchases had placed us on some mailing list that included advertisements for life insurance for babies (LOTS of them). This preys on the emotions of expectant parents and simply cannot be justified as a solid financial expenditure. First let me say that I was an insurance agent for many years, and retired to stay home with my son. I did sell life insurance, though I don’t consider myself an expert. My perspective is different, and admittedly skewed by my experience. I agree that the Gerber plan isn’t a great plan. That said, I bought a life insurance policy on my son when he was born. I pay the policy for ten years and it’s paid up forever. I get a discount on the policy by paying it annually, so his $25000 policy will be paid for by the time he’s ten. It also has a guaranteed insurability rider, which ensures that he can exercise an option to purchase additional coverage at twelve different ages (plus once when he marries) at healthy rates even if he is uninsurable. With his father being diabetic that was important to me. And it turns out he’s asthmatic. A double whammy. That’s the main reason I decided to buy it. I don’t have the policy illustration in front of me, but you’re right that it’s not a terrific investment. But no matter what happens to him he’ll at least have this policy, and he’ll never have to put another penny in. When he’s older he can supplement it with term while he’s raising his family, but as term rates are astronomical later in life he can cancel those if he has to he, and he’ll still have this policy. Additionally, if I ever do need to borrow money I can borrow form the policy, at it will still earn interest as if the money is still in the policy. So if it’s currently paying 6% and they charge 8% for the loan, the net cost to me is only 2%. Not a fantastic idea, but another option if I’m really in need of some cash quickly. And the interest is only taxable if I withdraw it from the policy (loans aren’t taxed). So, life insurance should in my opinion never be an investment, per se. What you’re buying is peace of mind. Sure,there are ways to make more money. But I’ve got the peace of mind that he’ll be able to have life insurance when he needs it. I never think of collecting on the policy – that wasn’t even thought about in reaching the decision. Really, G-d forbid a brazillion times. There are as many different opinions on insurance as there are insurance agents. This policy and term were pretty much the only policies I sold (we also sold Universal Life and a few other specialty policies). It always made sense to me to have a small whole life with Guaranteed Insurability supplemented by term, though I’m sure many disagree. @Sunbee – Depending on how much extra you’re paying, that seems like a more practical solution. Otherwise, the money is better off in your retirement fund or the children’s 529 plans. My husband’s and my 20 year term life insurance policies have a small rider for the children (works out to about 20K per kid, would cover some unpaid leave from work, burial costs, some counseling). This can be converted into a smallish (I think about 100K) whole life policy for them at 18 if they want. No reason to unless they were otherwise uninsurable, but the option’s there. If you’re worried about insurability of a child in the future, it’s probably worth asking your agent about. @Steve – I don’t know if my feeling is as strong as yours in term of the moral/ethical nature of the insurance. From purely mathematically perspective, I agree it’s a bad buy. I agree with the other comments. I’ve been horrified at this transparent attempt to play on the fears of parents. Gerber has made a disgusting marketing scheme and they should be ashamed of themselves. Even if they marketed it as “covering the costs in the event of accidental death” I might understand (although who wants to contemplate that?) but selling it as an “investment” is just awful. Horrible people. I try to avoid their products as much as I can, to be honest. @Eden – Thank you. I think whole life insurance in itself is not so bad as a product, but I agree that it’s ridiculous for babies. @My Dollar Plan – They are playing into our emotion. Parents want the best and everything for their babies. @Mrs. Micah – Sorry about your friend. I agree there are other options, if the concern is about burial cost. By the way, that’s very noble…donating your body. I found it a kind of horrifying concept. The only upside is that if your child becomes otherwise uninsurable, you can insure them through Gerber. But a rider on your life insurance policy for, say, $6000 to cover funeral expenses would be a much better choice. It’s not like you’d need the $25,000 anyway. But sometimes people don’t have the money on-hand to cover funeral costs, which is why it could be useful. One of my friends was killed in a car accident a year and a half ago and her parents had a hard time paying for the burial plot and stone. Last time I visited it didn’t actually have a stone yet. I’m donating my body to science to people don’t have to worry about it. But I might feel guilty about doing that with a child. It really is sad how much this product was pushed when we had our children. I’m sure there are many of parents who buy into the marketing and purchase this expensive unnecessary product without knowing any better. Great analysis. It really bothers me how they market this product to parents and probably to moms in particular. The commercials give a sense of making a wise decision for your baby’s future (who doesn’t want to do that), but as you pointed out it’s actually not a wise plan at all.